The excitement of “free clay day” can be felt throughout the school; it’s one of the most popular projects we do in the art room. With several days to a week’s notice, the children think about and plan what they would like to make with clay. They can choose their subject (barring anything inappropriate) to be built in a single session using one grapefruit-sized ball of clay. Introduce the project to the children at least several days in advance. Explain that they will have one ball of clay and one session to complete the building of their project and another session to paint it. Check the clay to be sure it has a good workable consistency. Wedge the clay into grapefruit-size balls, planning one for each child, plus a few extra. Set out balls of clay. When working with six- to thirteen-year-old children, set out rolling pins, needle tools, and containers of slip or water. When working with the three- to six-year-old children, moisten the clay a bit more so it will hold together without the need to scratch and slip. 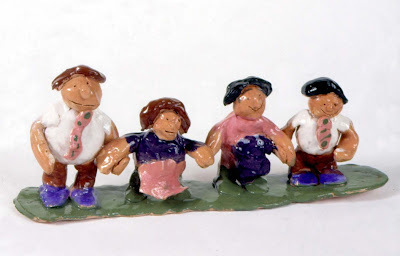 In this session the children will be making clay projects of their own choosing. Remind the children that they will have this session for building their project with one ball of clay and another session to apply underglazes. Discuss the children’s plans and point out ways that they might simplify ideas that might be too complicated to build in a single session. For six- to thirteen-year-old children, review the scratch-and-slip process for attaching pieces of clay—scratch the surfaces to be joined, apply a small amount of slip or water, and press the two pieces together. Remind the children that if they don’t scratch-and-slip their attachments, the pieces of clay will likely fall apart as they dry. Have the children build their projects. Alert them when ten minutes are left in the session so they have time to bring their projects to a conclusion. Note: Cover the projects carefully with plastic wrap, gradually loosening it to slowly dry the clay and then bisque fire them in a kiln. Explain that the clay has been fired in the kiln and is now referred to as bisque ware which is very fragile and must be handled carefully. The children will be adding color to the bisque ware using underglazes which are paints for clay. 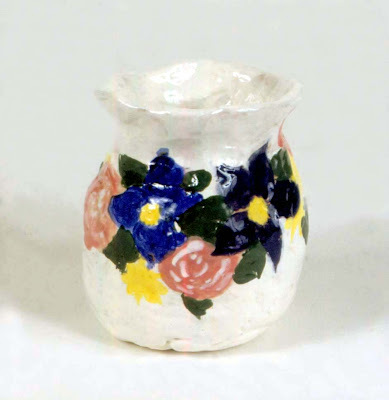 Have the children paint their projects with underglazes and allow the pieces to dry overnight. Note: While the older children can apply the clear glaze in a third session, have an adult put it on for the three- to six-year-old children. Remind the children that the clay has been bisque-fired and is very fragile and must be handled carefully. In this session, the children will be applying clear glaze to their projects which will give them a shiny and strong surface. Explain that the clear glaze will cover up the colors of underglazes temporarily. 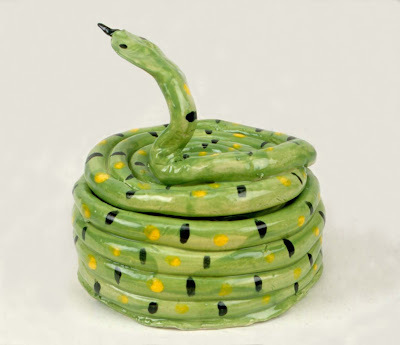 When the clay is fired in the kiln again, the glaze will melt and turn clear, allowing the colors to show through. Make sure the children understand that if any glaze gets on the bottom of the project, it will stick to the kiln shelf during firing. If glaze does get on the bottom, wipe it off with a damp cloth. 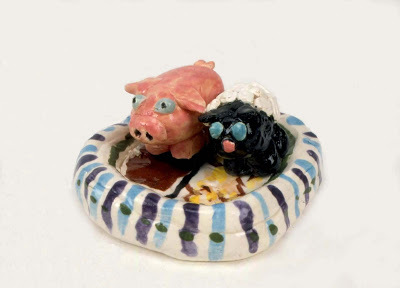 Have the children apply the clear glaze to the projects, reminding them to handle the bisque-fired clay very carefully. Note: Let the projects dry and glaze fire them in a kiln. In order to complete their project in one session, it is important that the children be given sufficient planning time before the class begins. Limiting the children to one ball of clay will keep the projects doable in the allotted two sessions. 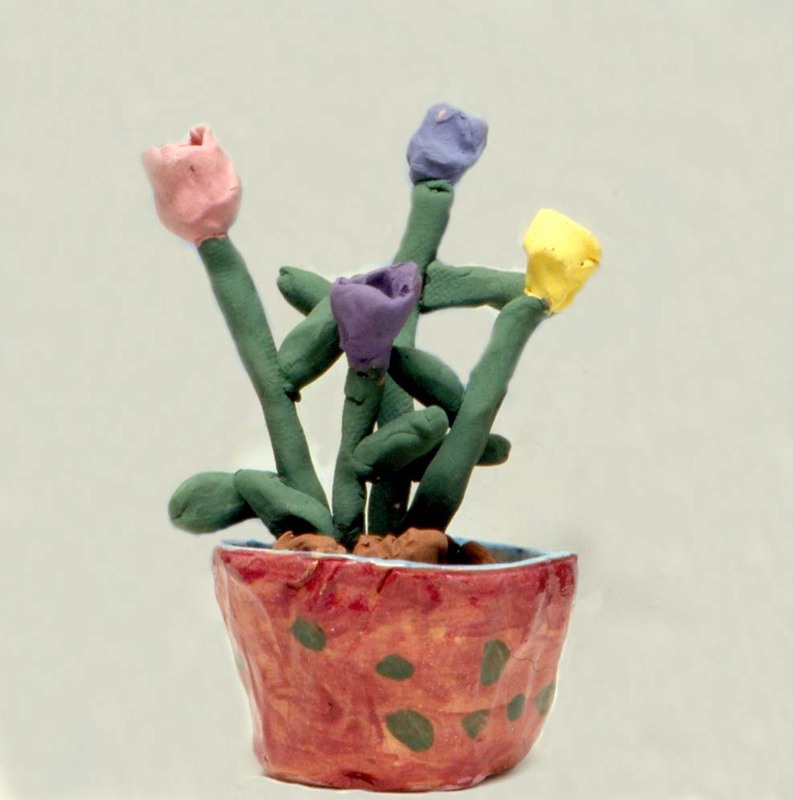 Approach this lesson with the three- and four-year-old children as an opportunity to experiment with the clay, rather than being concerned about producing a final project. Glazing the projects doesn't take much time, so plan an extra activity to fill the session or skip the third session and have an adult apply the clear glaze. 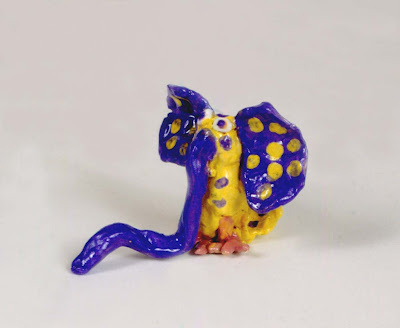 Have the children talk about the projects that they chose to make with clay. Point out examples where the pinch, coil, and slab methods were used. 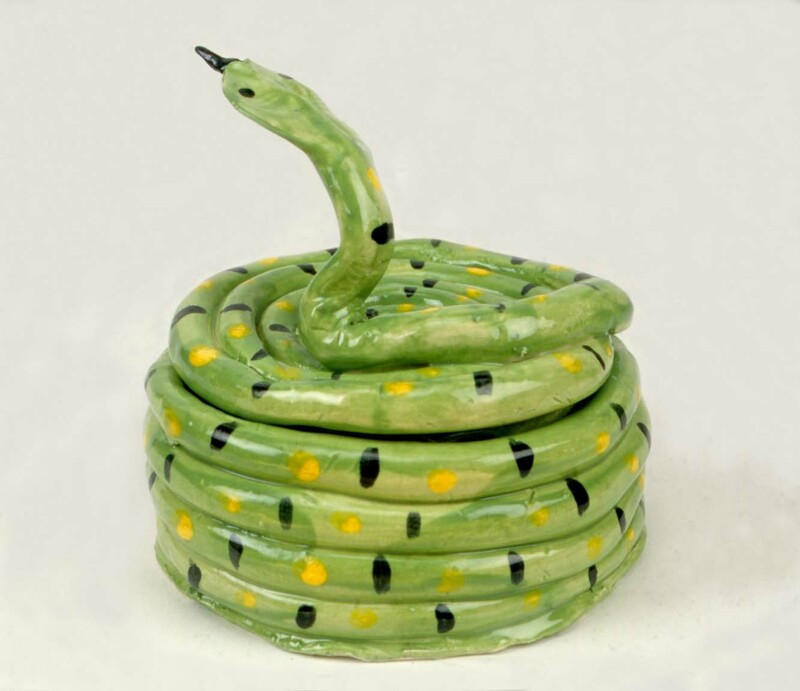 Discuss the many interpretations to this project demonstrating the versatility of clay. I want one side of my seesaw to be up, but it keeps falling down. I made flowers, but they won’t stand up in my pot. I’m running out of clay and will need some more. 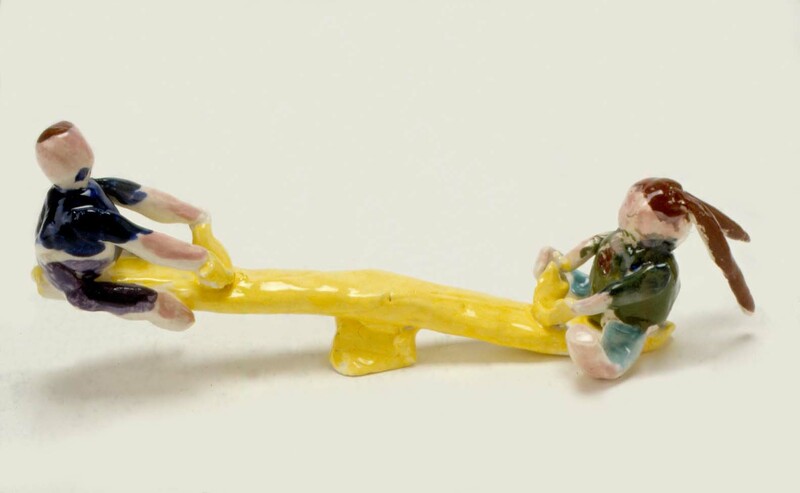 Use a box or an extra stump of clay to prop up the side of the seesaw. When the clay used for the seesaw dries, the box or stump of clay can be removed. Perhaps you could make some clay “dirt” to hold your flowers upright. In order to finish the projects in one session, you need to plan to use one ball of clay.